At the Bhowanipore cemetery in Calcutta, visitors can walk down the neat rows of graves with their tidy crosses towards the civilian section, to the plot where Charles Dickens’ son rests in peace. Lieutenant Walter Landor Dickens was one of the young “griffs” who died early in the service of the East India Company, on New Year’s Eve, 1863. It took another year for the news to reach his father in England, a letter announcing the lieutenant’s death followed by a packet of his unpaid bills. Two other sons were luckier—Alfred and Edward migrated successfully to Australia. Sydney Dickens died young, at 25, while pursuing a naval career—like Walter, he left his father a legacy of unpaid bills. Francis went from the Bengal Mounted Police to the Canada Mounted Police, and died in Canada in his forties. Dickens’ sons, except for Henry and Charles, were very much the children—and the casualties—of the Empire. Dickens and Jane Austen, two otherwise entirely dissimilar authors, had this in common: the colonies emerged in their books only as absences, as the shadowy plantations that supply the fortunes of the family in Austen’s Mansfield Park or the convict ships from where Abel Magwitch escapes to meet Pip on the moors in Great Expectations. The places that offered first opportunity and then a gravestone to so many of his sons were by and large, off his fictional map. Two hundred years after the birth of Charles Dickens, these gaps and omissions seem even more interesting. Peter Carey explored one in his disquieting 1998 novel, Jack Maggs, which told the Australian side of the convict story and featured an unpleasant but sharply drawn portrait of a Dickens-like Victorian writer, called Oates in the novel. It would be so easy to assume that Dickens was racist, if you take the silences as significant, or look more closely at his views of the 1857 Mutiny. But Dickens, of all the Victorians, stretched his imagination as far as it could go, forcing his readers to imagine the lives of orphans, or the children who fuelled the engines of Victorian factories, or clerks and scriveners. His imagination and his empathy, like many other men of his time, stopped at the borders of Britain. 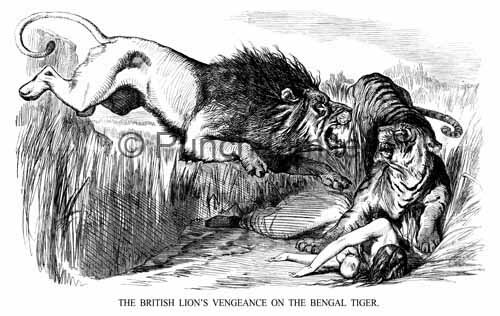 In the aftermath of 1857, many British writers in India wrote with eloquence and anguish of what they saw as the precious (if betrayed) trust between the Indians and the British. But the reaction at “home” in England was far more vehement for the first ten years, with the writers and journalists of the day expressing their opinion about the treacherous natives. Dickens was very much a man of his times, writing to his friend Angela-Burdett Coutts in a now infamous letter in 1857: “And I wish that I were Commander-in-Chief in India. The first thing I would do to strike that Oriental race with amazement (not in the least regarding them as if they lived in The Strand, London, or in Camden Town) should be to proclaim to them in their language that I considered my holding that appointment by leave of God, to mean that I should do my utmost to exterminate the Race upon whom the stain of the late cruelties rested; and that I was there for that purpose and no other, and was now proceeding with all convenient dispatch and merciful swiftness of execution to blot it out of mankind and raze it off the face of the Earth.” It’s an interesting letter—it begins by expressing a local frustration with the British gentry having disarmed the peasantry and the army politics of the day, and ends with this bloodthirsty promise. Walter Landor Dickens had left for India in 1857, just before the rebellion began. As Claire Tomalin sets down in her biography, Dickens was very much a Victorian father, which is to say his interest in the lives of his children was sporadic, often offhand. But Walter was just 16, and it is not impossible to believe that Dickens, with his vein of sentimentality, would have had the figure of his son and other young cadets and griffins in mind when he wrote to his friend. His bigotry and bloodthirstiness were commonplace, for the times. He had other things on his mind that year, much of which was occupied with the writing and serialization of Little Dorrit. The tone is almost mild, reasonable, focused on the mistakes of the British government rather than on vengeance. A Tale of Two Cities and Great Expectations have been written and have found their audiences; the unsuccessful Our Mutual Friend is being serialized. The anger so violently expressed in 1857 has dissipated, and for Dickens, as for most of the men of his age, the Mutiny and India and all of the colonies have receded into the far distance.